I can't believe we're already on Day 11 of the A to Z Challenge! We're moving right along here. I'm really enjoying reading other people's blogs, and getting the lovely comments that people have been leaving me - I appreciate you guys taking the time to comment! Today's post isn't a literary theme, because my brain just doesn't want to work on that, so I'm going to write about something I love to do: knit. My Grama, with the help of my mum, taught me to knit at a fairly young age. I've done it on and off over the years, but in December 2010, I started it up again with a cause in mind. For years, my Grama (who's 99, by the way) has been knitting mittens for a local organization that donates warm knitted/crocheted items to families in the area who might not be able to afford them. 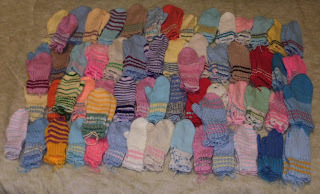 Each year, she tries to outdo herself, and last year, she knit 70+ pair to donate. She's already on her 20th pair for the year and it's only April. Pretty much the only thing I can knit is scarves, so I decided to knit scarves to donate - I've lost count because it's been a few weeks since I had time to knit, but I know I'm already close to the goal I set of 12 scarves for the year, so I'm thinking I'll double it and aim for 24. With any luck, mid-year, I'll be able to double that number and have a ton of scarves to donate this December. I'm also trying to figure out a pattern for hats so I can start making chemo caps for cancer patients and preemie baby hats for the local hospital. Well, I'm off to get some spring cleaning done. I had hoped it would be a beautiful sunny day so I would feel a bit more motivated and so that I could open all the doors and windows, but that whole April showers thing has thwarted those plans. I'm going to blast The Killers and U2 and pretend I'm having fun while I scrub! In case you hadn't guessed, The Killers are today's K band - I've loved them for years, since they were still an indie band and hardly anyone had heard of them, and I even got to see them live during their first Canadian tour. It's hard for me to pick a favorite song, but this is one of them. Enjoy! "The stars are blazing like rebel diamonds cut out of the sun, can you read my mind?" What are some of your hobbies? Do you knit? I love getting comments, you guys have been fantastic, and I'll be sure to visit you in return if you let me know you stopped by! Wow, look at all those mittens. You are a knitting queen! What a delightful post and oh those mittens. I envy anyone who can knit or crochet or do those crafty things. Not me. But my hobbies are singing, learning the piano, folkdancing and hanging with friends. And I, too, am enjoying meeting new bloggers and getting those comments. The knitwear looks fab. I bought beautiful coloured wool to go knitting, but I don't have the patience. I'm going to have go give it to a friend that does! I need more hobbies that get me out and about. I like to take classes now and again. I love baking. what an incredible age your granny is - and so industrious. You are quite the knitter. And what a wonderful cause. Hope you find a good hat pattern! I'm always so impressed with how generous the craft community is with charity work. I've done a tiny bit of knitting, but mostly I make jewelry. I do love The Killers!